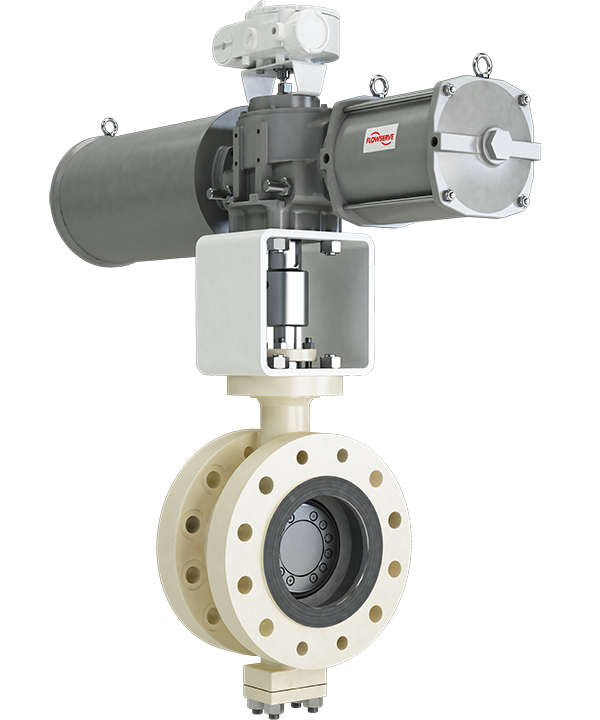 The Valtek Valdisk TX3 is a heavy-duty, triple offset butterfly valve that provides reliable long-lasting zero leakage shutoff. The Valdisk TX3 is combined with an actuation package that provides precise control. Available in pressure classes 150-1500 in carbon steel and stainless steel as standard materials with a wide variety of alloys as options. The high-performance Valtek Valdisk TX3 triple offset butterfly valve uses a camming action which reduces the possibility of galling or scratching on the sealing surfaces between the disc and seat. The elliptical sealing surfaces are completely in contact at the final position only, and upon opening, all contact points are released immediately from the seat ring. This provides reliable long-lasting zero leakage shutoff. Combined with the high-thrust actuator, the Valtek Valdisk TX3 achieve high performance throttling control in a wide range of industry applications. The smart positioner makes sure the valve is always in exactly the right position to optimize process parameters and provide operators with the information they need.